We’d love your help. Let us know what’s wrong with this preview of The Last Gambit by Om Swami. To ask other readers questions about The Last Gambit, please sign up. The Kindle editions have descriptions. This does not. Why? The year is 1983, and Vasu has just turned fourteen. At a local chess tournament, he meets the mysterious Anand Sharma, who sees his potential and offers to teach him how to become a grandmaster. Who is this old recluse, and how does he know so much about the game? After intensive lessons and no wins against the master, Vasu becomes discouraged. Over the years, he also struggles with school works, bullying, tough teachers, mean girls, and unpleasant chess opponents. But he is rewarded by his inc The year is 1983, and Vasu has just turned fourteen. At a local chess tournament, he meets the mysterious Anand Sharma, who sees his potential and offers to teach him how to become a grandmaster. Who is this old recluse, and how does he know so much about the game? After intensive lessons and no wins against the master, Vasu becomes discouraged. Over the years, he also struggles with school works, bullying, tough teachers, mean girls, and unpleasant chess opponents. But he is rewarded by his increasing closeness to his brother, his teacher's devotion, and first love. Will Vasu persevere against the odds and become India's first world chess champion in over 50 years? I'm not a chess player, but I found the story interesting and compelling. A glossary of Indian terms with hyperlinks would be handy, as the translate feature of the Kindle app didn't work for most words. There are some editing inconsistencies (e.g., the use of mom and mum), but the author's profession as a philosopher is apparent in his beautiful and insightful writing. Vasu's chess lessons are also important life lessons; as Vasu learns how to become a chess champion, Anand also teaches him how to become a winner in life. Vasu is lost in his own inner world, oblivious to the depth of Rea's love and devotion and the extent of his parents' sacrifices to make his dream come true. But rather than hate him, we sympathize with him, feel his guilt and self-loathing, and eventually his confidence and pride. And then there's that perfect ending in which everything comes full circle. This is one of those books that is all about apples, but really isn’t about just apples. As you peel each layer or say page there’s actually more to the story and you’re actually learning not just about those apples or even just other fruit, but the whole food system. Okay, yes, this book has nothing to do with apples lol, but that was the first analogy I thought of. This book’s outlined story is about a young teen boy learning to play chess from his chess grandmaster. The teen boy, Vasu, struggles at school and with bullies, but through hard work his grandmaster continues to teach him lessons that apply both on and off the chess board. This book’s inner story touches on friendship, family, love, mentorship, hard work, second chances, strength, forgiveness, and so much more. I have always wanted to learn to play chess. I have an app on my tablet that I sometimes play, but I’m still not very good at it lol. Although this book has a strong chess focus, you do not need to have a chess background to understand or follow along in this book. As a total chess novice, I was able to keep up. However, I will note, that if you do come from a chess history you might enjoy the book even more and appreciate some of the passages more passionately. I really liked the main characters. They were honest, realistic, and genuine. They were very well developed and greatly represented. This book touches on Indian culture and customs. Sadly, I not very familiar with their traditions, so I really enjoyed reading about them in this book. There is so much symbolism throughout this book. I enjoyed finding the different layers and multiple meaning messages throughout the book. I believe people always have room for learning and this book not only offers up some very important and valuable lessons – it was a joy to read! This book is engaging, enlightening, thought-provoking, stimulating, inspiring, motivating, and compelling! This book has so much to offer its readers and I would absolutely recommend this book to readers of all ages and all genres! I was impressed with this book and I think you will be too! This book takes your grip right from the first page as the mystery begins there. You cannot put this book down once you start reading.Though this book is classified under 'Fiction' it can easily go under 'Self-Help' 'Motivational' section.Simple story but there are nuggets of wisdom in this book one would like to follow in Inspiring! Motivating! Enthralling! This book takes your grip right from the first page as the mystery begins there. You cannot put this book down once you start reading.Though this book is classified under 'Fiction' it can easily go under 'Self-Help' 'Motivational' section.Simple story but there are nuggets of wisdom in this book one would like to follow in life. The book also goes on showing the value of dedication and determination one need to achieve anything worthwhile in life. There are no shortcuts to success. The chess lovers and players are definitely going to love this book too. Swamiji has a profound knowledge of Chess which one can feel while reading through time to time.It would definitely help even amateur chess players to give a new ray of hope if they are confused and seriously want to consider chess as their career.Book has all the aspects one would expect in fiction like Love, drama, mystery with suspense.It was very very nice read as always like Swamiji's all other books. “The Last Gambit” by Om Swami is, on the surface, the story of a young boy learning how to excel at chess. There are so many other levels that can be appreciated and the author’s voice effortlessly captures that of a youngster as he grows, so it is impossible to be bored even though the game of chess has never held a particular allure for me. I was fascinated to get a glimpse of Indian culture and mores even as I enjoyed the pearls of wisdom imparted to a young child who must learn to convert his passion into a work ethic that will stand him in good stead as he enters adulthood. The dynamics of family and mentorship are fascinating to learn about, even as one discovers how different life is in this country. Watching Vasu blossom from a self-centered and indulged younger son to a disciplined and respectful adult who learns adages such as “Learn to move at the pace you are comfortable with, learn to alter it effortlessly when necessary.” and “Success by design is infinitely better than a win by chance.” makes me happy I read this story and appreciative of the philosophy that permeates it. There are many great lessons to absorb as one follows the sacrifices that are required to achieve mastery and I think this is a great read for those of all ages. It is difficult to put this book down midway and it had me hooked right from the first page. I liked how well placed the wise life lessons were, within the chess lessons and that one didn't need to have a chess background to empathize with Vasu. It starts on an inspirational note with ideas such as "Success by design is infinitely better than a win by chance." But the end is rather emotional with views such as "(In life) Unlike chess, it's not your opponent but your loved ones who conquer you, c It is difficult to put this book down midway and it had me hooked right from the first page. I liked how well placed the wise life lessons were, within the chess lessons and that one didn't need to have a chess background to empathize with Vasu. It starts on an inspirational note with ideas such as "Success by design is infinitely better than a win by chance." But the end is rather emotional with views such as "(In life) Unlike chess, it's not your opponent but your loved ones who conquer you, corner you and checkmate you". The transition, however, is smooth. Within minutes I found myself switching from cheering for Vasu to win the tournament to rooting for his teenage love. Lessons Of Life Taught , while you enjoy the game of Chess. Simple Language, Simple Story, But Strong Lessons. Should Read ! Must Read !! Inspiring Story told in the backdrop of chess! Despite a lot of cliched bollywood movie like moments it is still a fine read . "Success by design is infinitely better than a win by chance." Vasu Bhatt is fourteen years old when a mysterious old man spots him at a chess tournament and offers to coach him, on two simple but strange conditions: he would not accompany his student to tournaments, and there was to be no digging into his past. Initially resentful, Vasu begins to gradually understand his master’s mettle. Over eight years, master and student come to love and respect each other, but the two conditions remain unbro "Success by design is infinitely better than a win by chance." Over eight years, master and student come to love and respect each other, but the two conditions remain unbroken – until Vasu confronts and provokes the old man. Meanwhile, their hard work and strategy pay off: Vasu qualifies for the world chess championship. But can he make it all the way without his master by his side? Inspiring, moving and mercurial, The Last Gambit is a beautiful coming of age tale in a uniquely Indian context. there are many a time, that some books live as inspiration for me, and this book is one of them. one cannot expect more from this book- I am strictly sticking to "inspiration" here. This spellbinding biographical portrait of Vasu excavates both a gripping story full of chess and a vivid account of morals of a game and even for life. Om Swami does a fabulous work of interweaving and creating a story out of the threads of chess, sports, morals and teeming and lucid narrative. ever since I have started reading Om Swami’s books – the first of which was “Kundalini”, I have become a fan of him. writing accounts of lives of others, let be even fictional and adding to values and lessons to it- which somehow the story is but not at all exactly exhilarating like that- is a critical subject and more critical are it’s retelling- as the author has never gone to that field himself but has written it as per other's experience in those fields- as if you do not know the tale properly and cannot narrate it in a gripping way then the reader would not find it interesting. the best part of the book is its beauty in the simplicity of language and the complex and gripping narrative. I felt that the beauty of the enchanting narration makes the book truly a “masterpiece”. one cannot put down the book in the middle if you have started once. for the narration, it is just mind-boggling. the way he captures each character and emotions in his pen would leave you enthralled. adding to that are the intense dialogues and the impact they create on your mind. this book would leave a mark in your heart. there are hidden messages of courage, perseverance, patience, struggle and all qualities of a hero. just one thing to poke will be that sometimes the book goes totally dry when scenes of lectures or other melodramatic daily life scenes start. the book totally is worth reading. and if you have not read it, it is totally your huge loss. overall the book is in simple words a “masterpiece”.a perfect tapestry of history and imagination. not only children, each and everyone can relate to this story of this man, Vasu. This review has been hidden because it contains spoilers. To view it, click here. “The Last Gambit” is a YA coming of age novel by Om Swami, centered around Vasu, a young Indian boy training to be a master chess player. Vasu meets a mysterious man who becomes his chess master, on two conditions: the master will never accompany his pupil to tournaments and Vasu must never pry into his master’s past. As Vasu grows into an adult and a world-class chess player, he must decide how his relationship with his master will evolve and learn where chess really belongs in his life. 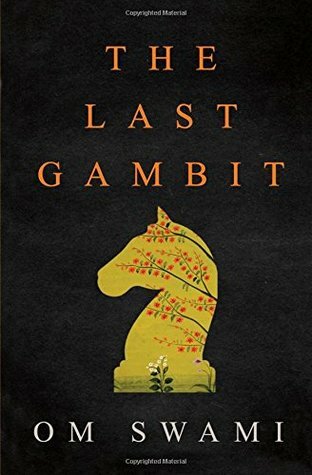 In the s “The Last Gambit” is a YA coming of age novel by Om Swami, centered around Vasu, a young Indian boy training to be a master chess player. In the simplest terms, “The Last Gambit” is a treasure. It’s heartwarming, full of culture and cheesy life lessons loosely veiled as chess tips. And Vasu leads the whole story with his endearing enthusiasm, growing from a (fairly annoying, I’ll admit) teenager into a passionate young adult. It’s a classic coming of age story, one that personally struck home with me, when it came to passion and prioritizing your dream. As his master tells him from the start, Vasu must choose over and over again to continue pursuing chess above all else, in order to be successful. And though the novel is centered around chess, and contains plenty of technical information about the game and its various gambits, it reads easily and an understanding of the game isn’t actually necessary. From a technical standpoint, the book suffers from run-of-the-mill ESL issues; there are odd phrasings and formatting problems on every page, but it honestly adds to the authenticity and heart of the culture in the story. The Indian elements are immersive, both in the specifics of Vasu’s home life and in the characters and their relationships with each other. This book turned out to be a surprise to me. I was not expecting much from this book but have bought it just by looking at the cover. The same cover that tempted me to purchase it was unable to tempt me to pick it up soon. Still I picked it up and then suddenly I was sucked into it. One day. That's all I needed to read it. Although due to my busy schedule I am unable to read books enough but this one here once tasted, pulled me into it completely. This is a story about game and life but the autho This book turned out to be a surprise to me. I was not expecting much from this book but have bought it just by looking at the cover. The same cover that tempted me to purchase it was unable to tempt me to pick it up soon. Still I picked it up and then suddenly I was sucked into it. One day. That's all I needed to read it. Although due to my busy schedule I am unable to read books enough but this one here once tasted, pulled me into it completely. This is a story about game and life but the author has made it so real that I was unable to pull myself out of this. Even though I don't know the technical terms of chess, this book taught me a lot. Not about chess but about life. This book is an inspiration in itself. While reading it I found myself so inspired and pumped up to work that I could not even trust my own moods. I fills you with tremendous energy and hope and the path ahead suddenly seems easy. Although I had never heard of this book or author, I was glad that I picked up this book. This filled me with explainable energy and power. Sometimes, books like these, the hidden gems, provides us so much insight upon the life that all the hype for other books seem superfluous. I will suggest you all just one thing, Do give it a try because I loved it. It is not only a beautiful story about the young Chess player and his master, rather it draws parallels to real life. Travelling through ups and downs very much like life, the story illustrates the journey of an aspirant towards success. The wisdom of the simple looking master was imparted patiently to the young boy that slowly transformed him. Chess was the master's life, however, the master taught more on Life than on Chess. Not only, he made the young boy successfu A wonderful book! Inspiring! This review has been hidden because it contains spoilers. To view it, click here. Loved the story. There are different aspects to the plot and each one has been described beautifully. Each character in book has its own different shade and attitude towards life. A recluse master paying the price of being GM. Chess was everything for him till he suffered the losses in life. Protagonists journey to a champion, one can learn a lot from his setbacks. A loving and protective mother. Supportive father. Caring siblings. One thing which felt missing towards the end was his love, Rhea. Completed this beautiful Fable with a pearl of tear shining in the corner of my eye. The first Fiction work from Om Swami and what a narration. A complete story book for a block buster movie which will motivate and inspire you to the fullest. And the life lessons shared and gently mixed with chess lessons and give us a smoothie to imbibe. "Master the basics , Know when to float verses when to swim or steer". An awesome read. Inspiring and motivating with number of spiritual wisdom embedded in the story. Gripping you with suspense and excitement to follow. Awesome Story line. Best to read during leisure time or any part of the day. Very simple language and easy to go pace. I realised the importance of my mentors and have developed more respect for them. A good read for all. I liked it so much so that I bought it and will now preserve it forever. I cried in the end. One who is in process of discovering himself\herself can only understand the importance of Master. And one who understands that, will understand this book. Kudos to the author. Awesome! Simple story with lots of positive lessons and messages. I feel humbled. Thank you, Om Swami. Very exciting reading this book. The story is not something extraordinary. But the writing is easy and keeps the user intrested. story pace is good. An inspiring and educational read about chess and even more so about life - What it takes to achieve mastery and how it's mindless pursuit can cost one that which is meaningful. A book to be read when you are in your teens. Certainly better than Chetan Bhagats like! But not a book I would recommend to anyone! Finished it in one sitting. Truly captivating and has some beautiful lessons about life as well in it. As a story, it has a rare plot - that of a student and teacher. As a spiritual read, it slips in the meaning within you, touchingly. Loved the book. My daughter loved it too. it is a must read. It was like a movie playing in front of me. Awesome story telling with good message. I perhaps expected lot more from Om Swami - this book was more like a Bollywood movie. quite predictable, nothing exceptional, but lucid and engaging read.